Throughout high school, college and NFL football, 2-point conversions are generally underutilized. Many games now with high powered offenses will have an expected conversion rate this is close to or even exceeds 50 percent, which makes the long-term point expectation 2-point conversions nearly equal that to just kicking the extra point. 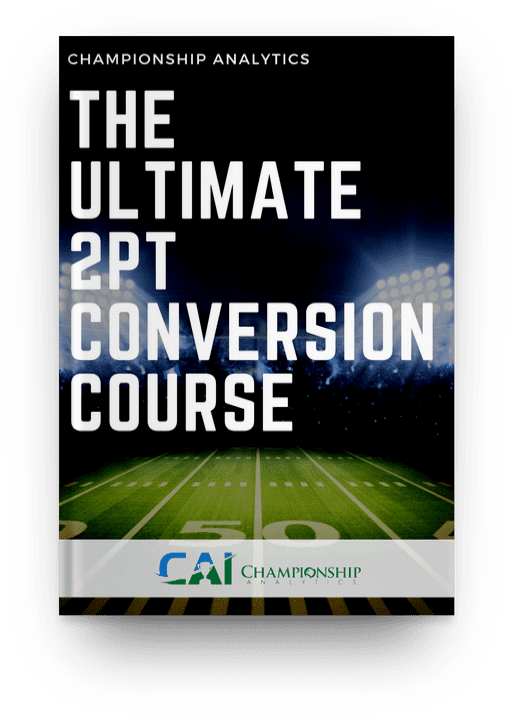 The CAI Strategy Academy 2-point conversion course gives coaches the information that they need to employ optimal 2-point conversion strategies, which will maximize your chance of victory. Whether you should punt on 4th down & 5 on your opponent’s 45? When to start using timeouts defensively to save time when you’re trailing? How early should I start going for 2? Should I go for 2 when we cut the lead to 9? What situations are there where I should definitely not kick FGs? How aggressive should our offense be towards the end of the first half? When is it more important to burn clock or stay aggressive with a lead? When are the ideal times to try onside kicks? Should I ever kick on 4th & 1? When it is beneficial to either give up an intentional touchdown defensively or not score a touchdown offensively? In this course, CAI discusses how coaches should handle situations and employ game-winning strategies that might come up every game, a couple of times in a season or only once or twice in a career. CAI's situational philosophies derive from CAI's data analysis, and CAI explains the rationale behind our recommendations so coaches can improve their football strategy knowledge and win more games. In this course, you will find hundreds of scenarios that have grown very familiar to you: what to do on 4th-and-short from your own 45; whether to go for 2 early on and risk spending the game chasing points; whether to attempt an onside kick. This course analyzes scenarios such as these in detail and follows each option down to its respective conclusions. You might be surprised by how CAI's statistically based recommendations initially appear counter to years of conventional wisdom. Rob Ash coached at the collegiate level for more than 35 years, and coaches who sign up for the CAI Strategy Academy can email Coach Ash and CAI's founder, Mike McRoberts, with questions regarding in-game strategies. Each week during the 2018 season, CAI will feature a Situation of the Week that we will discuss as part of the CAI Strategy Academy. 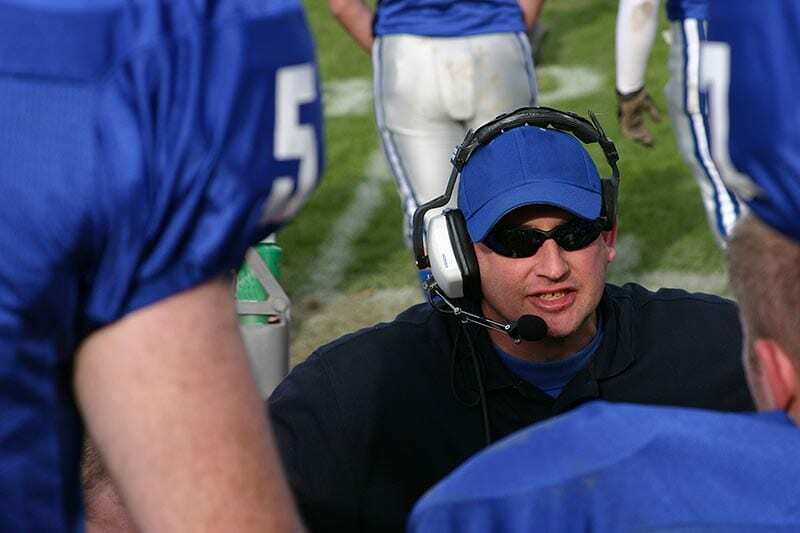 Coaches can read about CAI's recommendations for how coaches could have handled the most interesting and pivotal situations from across the country right after they happen. CAI will provide coaches with checklists and cheat sheets they can print out and use during games. Why take a closed-book test when you can take the test with your notes? CAI Strategy Academy checklists and cheat sheets provide the coaches enrolled in this course with information they can use in real time to win more games. Using CAI allowed me to coach the way I love to coach—being aggressive and going for it with confidence and without hesitation. I think every staff needs CAI as a resource. I wouldn’t want to coach another season without it. I wish I’d had the opportunity to use this for the past 25 years. It absolutely is beneficial to our team, to our staff and to our success. I don’t want any of our opponents to use it. That’s the best endorsement I can give. What is the CAI Strategy Academy? Coaches today can plan for every scenario and aspect of their program. From recruiting, to player development, to X’s and O’s, NFL and college staffs invest in game preparation to reduce risk and enable better decision-making. When it comes to in-game strategy; however, coaches are often forced to make real-time game-altering decisions. Despite meticulous preparation, coaches too often rely on instinct versus proven facts. Championship Analytics, Inc. (CAI) was founded in Atlanta, GA in 2011 with the goal of integrating world-class analytics with a coach’s insight to take the guesswork out of in-game decision making. CAI invented and patented the CAI Game Book – a first of its kind playbook that delivers the proper decision for any scenario from the opening kick to the end of the game – customized for the match-up, no computer required. CAI works with more than 60 football teams, including teams from the NFL, Big Ten, Pac-12, SEC, ACC, CUSA, AAC, MAC, Mountain West, Sun Belt, Ivy League, Big Sky, Patriot League, CAA, Big South, Ohio Valley Conference and Pioneer League. The average CAI team went for it on fourth down 23 times in 2017, whereas opponents attempted an average of 19 fourth-down plays. CAI had eight of the top 12 and 14 of the top 24 teams nationally in fourth-down conversions. CAI teams converted 435 of 799 fourth-down attempts (54.4%), while rivals converted only 899 of 1,778 attempts (50.6%). CAI teams scored touchdowns on 62.3% of red-zone drives. Competitors scored touchdowns on 61.8% of such drives. CAI clients averaged 5.04 points per red-zone drive, whereas competitors generated only 4.99 points per red-zone drive. CAI clients averaged fewer turnovers per game (1.45) than opponents (1.53).